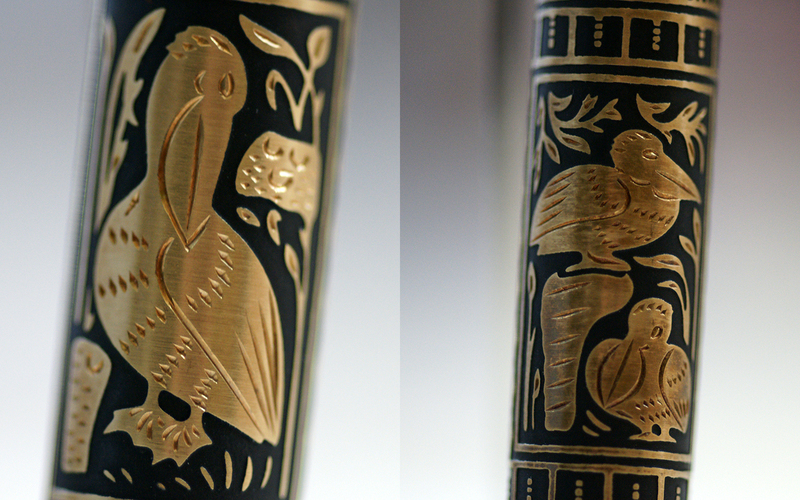 First released to the luxury market in 1931, the Pelikan T111 featured a steel binde (BIN-duh) hand engraved in the Damascene style, a technique imported to Toledo, Spain by the Arabs. Damascene artists traditionally decorate steel with threads of gold and silver to create beautiful, painstakingly crafted pieces. The Toledo models of today use a sterling silver binde rather than steel to which a thin layer of gold is applied. The technique that is used to produce the Toledo has changed very little over the past 85 years. Pelikan re-introduced the Toledo in 1986 with the M700, an M4xx sized pen depicting the classic Pelikan Toledo motif. Production has always been limited by the unique, hand crafted nature of each pen that rolls off of the line (Pelikan cites a quantity of just 200 pens produced per month). 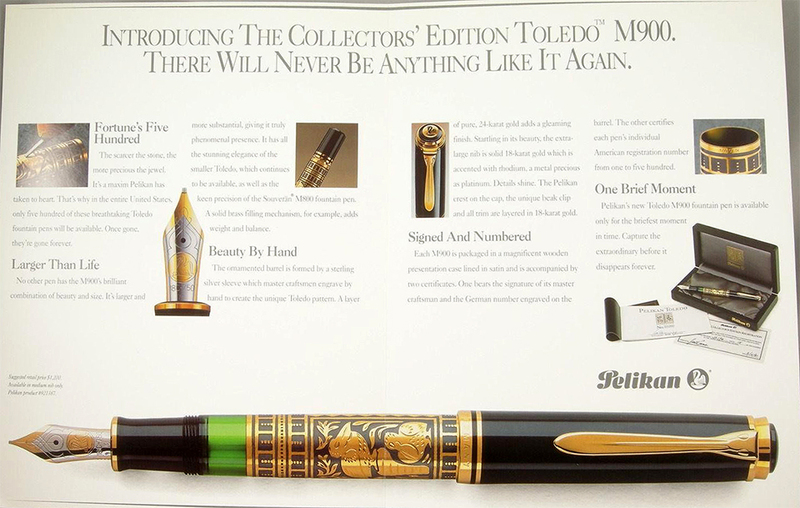 In 1991, Pelikan introduced the M900 Toledo, a pen with a similar design and motif but in the larger and heavier M8xx form factor and meant as a limited edition. The M900 was billed as “The Collectors’ Edition Toledo” in the United States and released as a run of just 500 pens earmarked specifically for the North American market (some accounts report an additional 500 pens made for sale overseas). Each North American pen came with a certificate declaring the rarity of the release. This exquisite model sold out quickly with many collectors being spurred into action by the limited and distinctive nature of such a release. The story might have ended there if it were not for Pelikan’s decision to re-release the M900 as a standard issue pen which has since enjoyed a lengthy production run. The original run of M900s can be distinguished from the later production models by only a few subtle characteristics. The cap band on the initial run bears the inscription “W.-Germany” whereas the models that followed were inscribed “Germany.” The engraving near the piston knob initially lacked the “925” marking that was included on models from the second batch. Believe it or not, that is about the extent of what separates the different batches, paperwork aside. 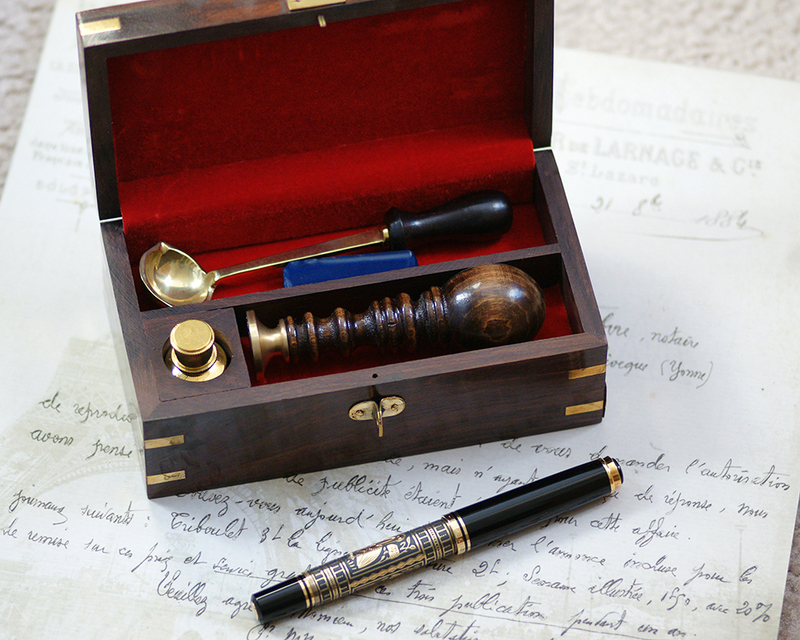 The only other thing of note is that some of the very early M900s from the second run included a 20C-833 gold nib (depicted to the right), later replaced by the same 18C-750 nib found on the original run. The MSRP on those earliest M900s was $1200. The certificate was finished with an inspector’s signature and a date. An accompanying sales brochure was available at the time which also extolled the rarity of the release. The front of the brochure declared, “Something Extraordinary is About to Disappear Forever.” Open the leaflet and the headline, reads “Introducing The Collectors’ Edition Toledo M900. There Will Never Be Anything Like It Again.” I think that we can all agree that Pelikan’s literature unmistakably indicates just what a limited release this was intended to be. You can then understand the anger and betrayal that collectors felt when Pelikan re-released this pen to the masses in an unlimited run (and with cheaper pricing) thereby diluting much of the perceived value of the original purchase. One such disgruntled and well known collector attempted to file a class action lawsuit in a case known as Zazove v. Pelikan, Inc (Zazove v. Pelikan, Inc., 761 N.E.2d 256 [Ill. App. Ct. 2001]). The law firm Krislov Law handled the suit on behalf of the collector and touts the case as a notable decision achieved by the firm in consumer protection matters. 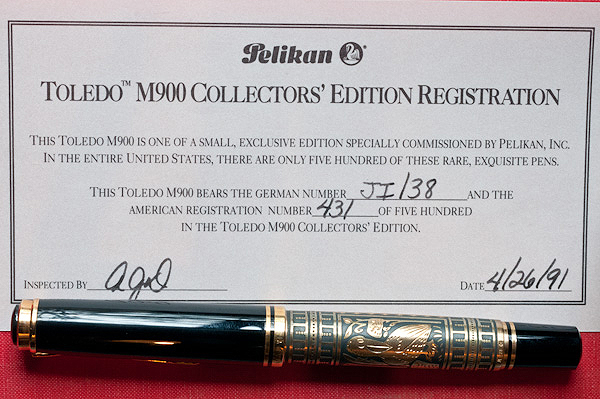 The broad overview of the litigation is that a gentleman from Illinois purchased a Pelikan M900 Toledo from the initial supply of 500 pens at a price of $1200.00. He figured that he was investing in an item that would become a rare collectible with time. 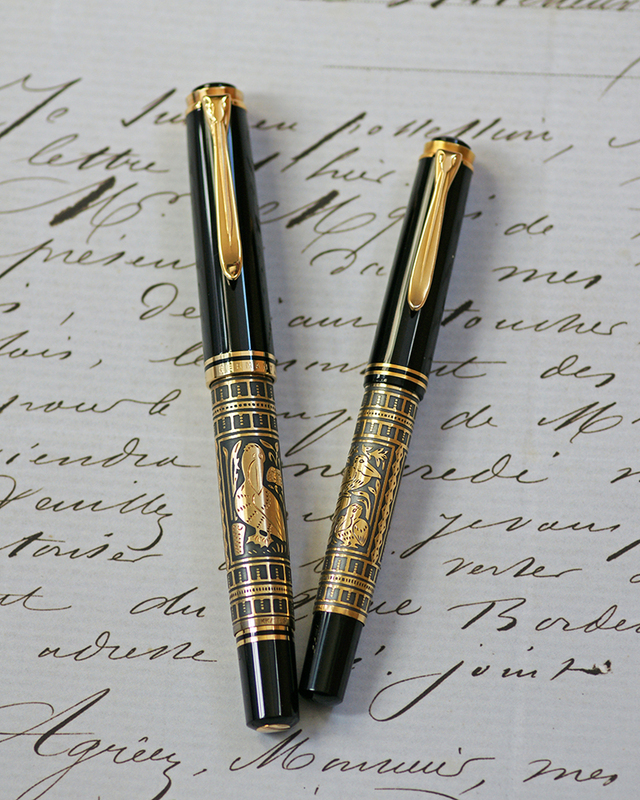 He was later informed by a Pelikan representative (circa September 1997) that the M900 Toledo pens were now widely available for sale to the general public. Shortly after that, in October, he received a brochure from Fountain Pen Hospital which listed new M900 Toledo pens at $1,075.00, a full $125 cheaper than the original run. The suit is based upon the notion that Pelikan violated the Illinois Consumer Fraud and Deceptive Business Practices Act (815 ILCS 505/1 et seq. (West 1998)) and sought declaratory and monetary relief for the class of persons who purchased the first 500 Toledo pens, as well as attorney fees and costs. On January 5, 1998, Pelikan-USA filed a special and limited appearance and on July 30, 1999, Pelikan-USA moved to dismiss the complaint against it for lack of personal jurisdiction, pursuant to section 2-619(a)(9) of the Code of Civil Procedure (735 ILCS 5/2-619(a)(9) (West 1998)). On February 18, 2000, the plaintiff’s class action complaint against defendant Pelikan, Inc. (Pelikan-USA) was dismissed by the circuit court of Cook County for a lack of personal jurisdiction. 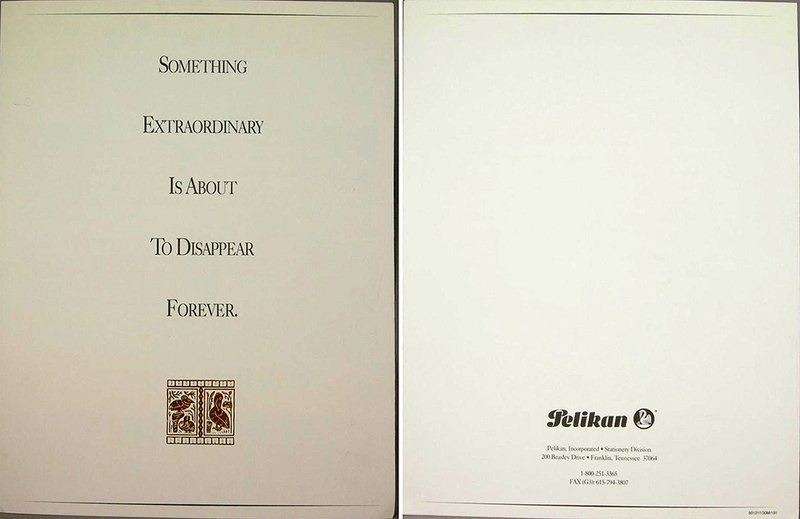 Pelikan-USA ceased operations in March 1996 and had no offices or employees at the time of the litigation. They argued that they never sold pens directly in Illinois and that litigating in that state would be burdensome. An appeal was filed on November 30, 2001 with the sole issue on appeal being whether the trial court erred in dismissing the complaint against Pelikan-USA for lack of personal jurisdiction. Defendant Pelikan International Handelgeshellschaft mbH & Co., KG. (Pelikan-Germany) was not a party to the appeal. After a bunch of legal maneuvering, the appeals court ultimately reversed the initial dismissal, a decision seen as a victory for consumer protection. The case established Illinois jurisdiction over a foreign producer of consumer products for consumer claims under the ‘stream of commerce‘ concept. While this was a victory in one respect, I could not find documentation of any further legal proceedings in the case leading me to conclude that the suit ultimately failed to achieve its desired outcome. Perhaps its simply a quirk of the legal world but nowhere in the suit did Pelikan ever claim innocence but rather focused solely on the Illinois courts lack of jurisdiction to litigate them. While the plaintiff and those other 499 enthusiasts may have ended up on the wrong side of a bad deal, the rest of the community certainly benefited from the wider availability of a gorgeous pen. It is a shame that Pelikan did not honor their initial promise of exclusivity and thereby misled those initial 500 consumers. Thankfully, this is not a mistake they have often repeated which hopefully means a lesson was learned. Wonderful article, Joshua! I had no idea that Pelikan was sued because of this. Thanks Luiz. The Toledo was my grail pen as well and is every bit as magical as I’d hoped. It does not disappoint. I report what I see and hear and will certainly let everyone know if there are any credible rumors for next year. We may not see them as fruitful this year since Pelikan was very displeased last year. I’d even heard of threats of legal action based off of those leaks. Also, there is new leadership in the fine writing instruments division. All of this may lead to less product leaks but I’ll remain vigilant for my readers. Wow! I didn’t know that Pelikan was becoming “hard line” like MB. But thank you for keeping us informed. I am one of the 500 victims of Pelikan’s deception in this matter. I followed the lawsuit with interest, and was disappointed when the legal system, as usual, failed to rule justly. It is probable that the judge(s) thought that purchasers of such an expensive pen did not deserve the help of the courts. At this juncture, I am glad that I bought one of the original 500 M900s. It is a beautiful pen, and it writes magnificently. It’s a shame that its value has been diluted by Pelikan’s dishonesty, but I’m still not sorry I have it. At least there is a distinguishing feature, the “W. Germany” on the cap band, that verifies the authenticity of the pen, along with the original certificate. I’m grateful that Josh has reminded everyone of this incident. Perhaps Pelikan will be embarrassed sufficiently that they will never pull such a stunt again. Sorry to hear that you got caught up in the misleading sales pitch. I agree that there is still something about owning one of those original M900s. Based on their release history since, I do think that Pelikan learned a lesson. I suspect that the biggest offender here was Pelikan-USA more so than Pelikan-International. I think they were overzealous resulting in them overselling the product’s rarity, a decision that Hannover was not beholden to. Perhaps this debacle is one of the reasons that Pelikan changed distributors in 1996. Nice work Mister. I have my M700 version and it meets my needs. Thanks! The M700 is a real beauty. Enjoy it! Good article, Josh. I never thought Pelikan would be capable of doing something so misleading and unfair to its faithful consumers. All I can say is if I could even afford one of those special “rare” birds, I would certainly be wary of buying one again. Thanks! This event occurred over a decade ago and has not been repeated since to my knowledge. I do think a lesson was learned here. I have my suspicions that that fault may have lied more with the US distributor than Pelikan International but, of course, there is no way to really know what went down all those years ago. Well, that’s good to know that they haven’t repeated it, and it’s been over 10 years. Certainly does seem like they are determined not to repeat it. And I can see how an overzealous seller could over-promote the rarity of an item like that. Despite all that, it is a beautiful pen!